Why join the hybrid revolution? Air source heat pumps use basic thermodynamic principles to convert latent heat contained within the air we breathe into heat energy that can be used to provide heating and hot water. This �ambient heat� is replenished by the sun making our heat pumps both effective and environmentally friendly. 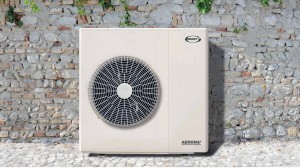 There are two types of air source heat pump � �air to air� and �air to water�. Grant Aerona ASHE heat pumps use an air to water system which utilises heat energy captured from the air in �wet� heating system radiators or underfloor heating.�The process uses the same vapour/compression cycle that extracts heat in a domestic fridge. A refrigerant with a low boiling point is exposed to external air temperatures in an evaporator. The liquid boils off to a gas and absorbs the latent heat energy of the air. This gas is then compressed increasing the heat content in the refrigerant, before passing through a heat exchanger where it condenses back to a liquid state while transferring the heat to the water of the heating system. The liquid refrigerant is then re-circulated through the evaporator and the cycle is repeated. With the recent fluctuations in price and supply of fossil fuels, Grant air source heat pumps offer both an environmentally and economically sustainable alternative. �Home heating in the UK accounts for approximately 30% of CO2 emissions and the heat source used by Grant Aerona ASHE heat pumps is entirely renewable which helps reduce the amount of harmful greenhouse gases being released into the atmosphere and, in so doing, lowers the carbon footprint of the household. Air source heat pumps must be correctly sized to ensure that it can provide the required amount of heat output at the design conditions � typically when the outside temperature is at -3�C. To do this an installer must first accurately determine the heat loss from the property and then, using this information, correctly select the required size of heat pump based on the design outside air temperature. Grant has�a range of stainless steel cylinders specifically matched to the Aerona, which incorporate a larger primary coil for quicker heat transference. The cylinders are available in seven indirect single coil versions, ranging from 125-400 litres and five indirect twin coil versions ranging from 170-400 litres. Grant Heat Pump cylinders feature compression fittings which are conveniently located to make installation quicker and easier. For further information,�click here.